This is a test kit which contains a single one ounce container for each of the colors in the Sculptural Arts lineup including the metallic colors. Great for small scale mock-ups or just to experiment with colors. The reusable box, brush compartment and data sheets were designed to make the Starter Kit a portable tool box for the artist on the go! 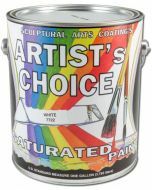 All Artist's Choice colors mix together easily to create any hue, shade, tone or tint desired. Stir thoroughly. 10.75" x 17.5" x 2.88"